First off, what the heck's a Summoner when it's at home? Well, a Summoner was an official in the ecclesiastical court whose job was to summon people to attend - much like an usher. In the Canterbury Tales, the Summoner's Tale is about a Friar who exploits the peasantry, obtaining food and money from them, and convincing them that such benevolence will help them attain their place in the Kingdom of the Lord. 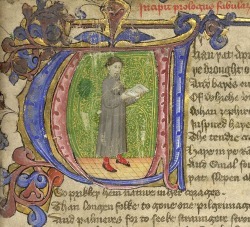 The story also has several references to one of Chaucer's favourite subjects - flatulence. My Summoner's Second Tale concerns a bet waged between the Devil and St. Peter to tempt two innocent peasants into sinfulness. For the record, there are no references to flatulence. Quod, “As I’ve said already, have no fear. To hammer out an up-to-date accord. As well as Nick who’d cook their sinful goose. Of work’s increased a hundredfold of late. And God’s the one to lend a helping hand. A fairer share of labour would be half. If Hell’s to keep its ovens stoked and fed. To equalise these figures is a must. Another Tale for which I completed an abridgement some time ago is The Pardoner's Second Tale. Set during the Black Death's reign in England, during 1348, the story follows the personification of Death while he rounds up the dead and ticks them off his list. In fact he comes across as not such a bad bloke, afterall. There are also two Canterbury Tales set in the Middle East (where I live and work) in their early stages of evolution into 'Second' Tales, and an old Babylonian story has taken my fancy, if only I can get the characterisation right. As for a book of 'Second' Canterbury Tales, the manuscript and proposal have been doing the rounds. So until I clinch that multi-million dollar publishing deal, academics and Chaucer students will have to make do with The Monk's Second Tale, aka Robin Hood and Friar Tuck: Zombie Killers - A Canterbury Tale by Paul A. Freeman.